Hello lovelies! Today I have hooked up with a fabulous group of bloggers to share our crochet pillow projects with you. It’s all part of a fun blog hop sponsored by Simplicity. During the hot summer months I often forget how much I love to crochet! 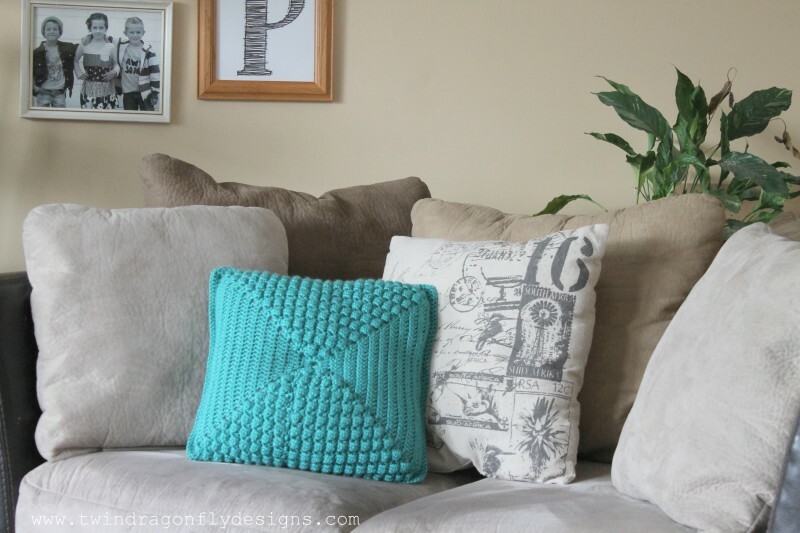 This Crochet Bubble Pillow was a quick project that adds a pop of color and texture to our living room decor. The folks at Red Heart sent us some of their uber soft yarn to use. 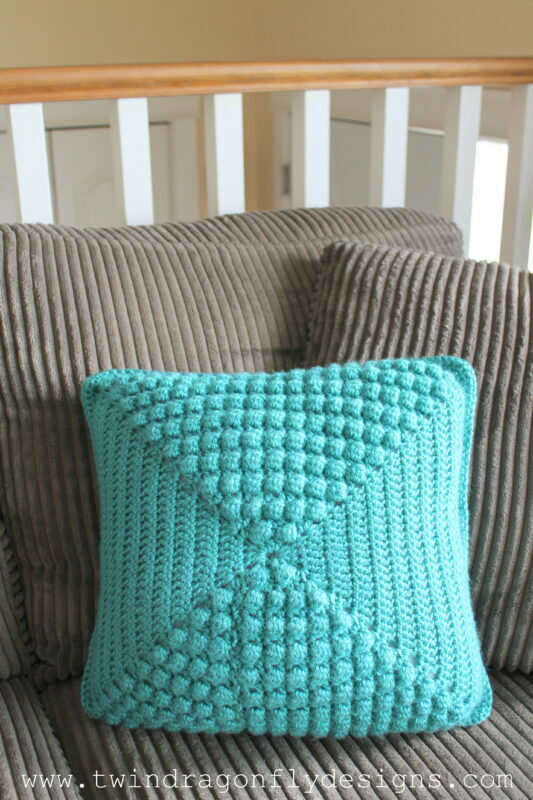 For this pillow I used Red Heart Soft Yarn in Deep Sea. This yarn is super soft and awesome to work with! Seriously I wanted to snuggle up to the whole skein. We have accents of turquoise throughout our home and this pillow is the perfect addition to our collection of sofa cushions. I used this Pillow Popper pattern from Linda Permann on Ravelry. 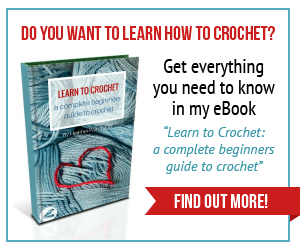 It worked up quickly and would be a good beginner project for someone wanting to practice their single and double crochet stitches. Bubbles are far easier to create than they look – trust me! Mmmmmm soft and smooshy! 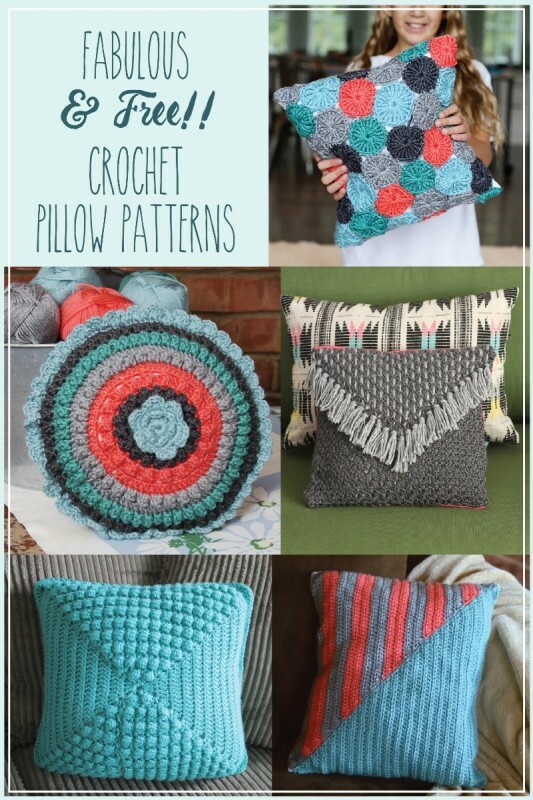 Be sure to check out all of the gorgeous pillows and enter for your chance to win a ton of crochet goodies! 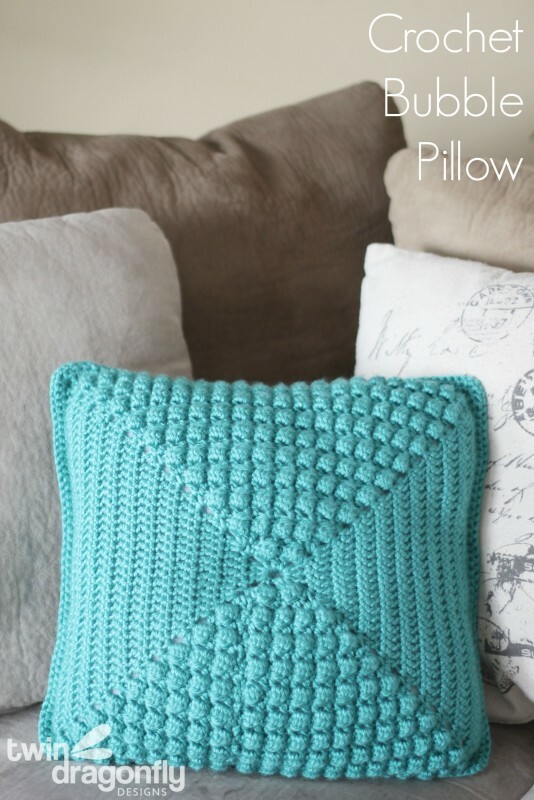 Enter to win our Crochet Pillow Blog Hop GIVEAWAY!! 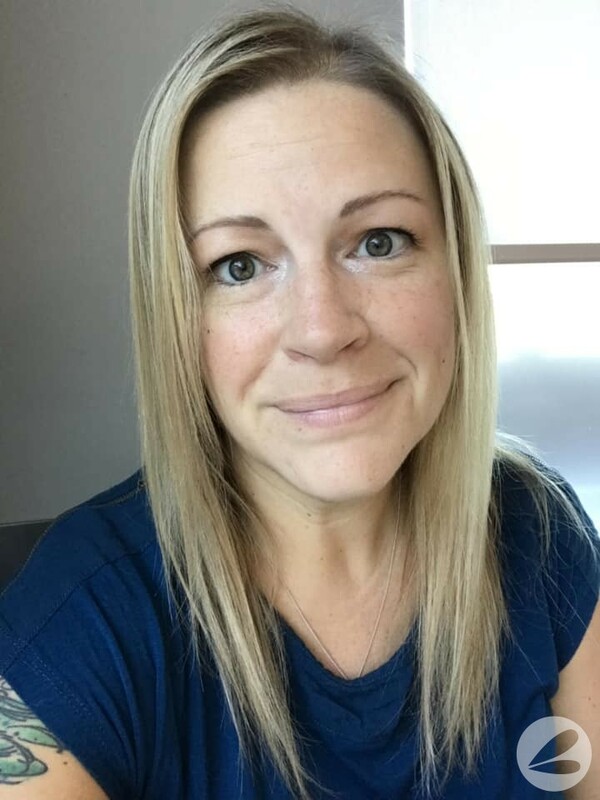 Prize – valued at over $200! I love it Heather!! It’s such a great pillow and those little bubbles are so cute! 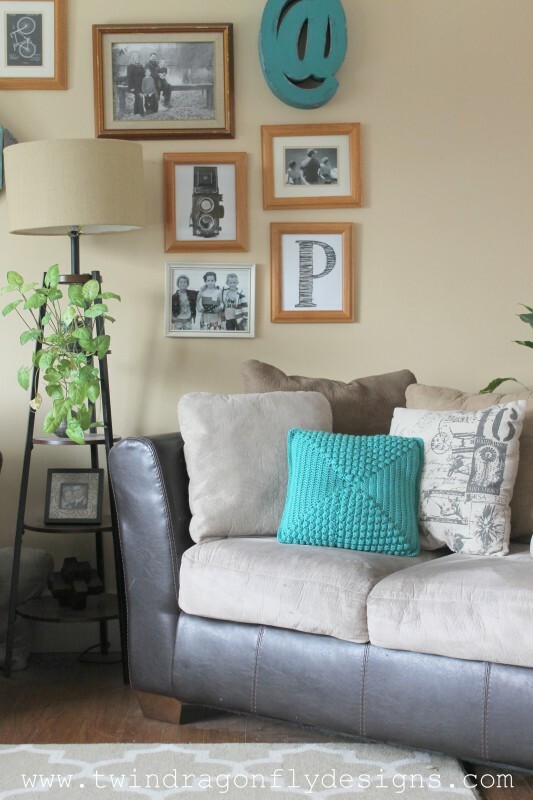 I love the pop of color the pillow gives your couch too. So fun!! I would LOVE to win this yarn! I’d start off making a pillow from this pattern (I love it! ), then I’d use the rest of the yarn to make baby hats to donate to the NICU. My kids need hats and mittens for the winter! i’d love to crochet some with this yarn! Awesome!! I’d love to win this fabulous prices!! Love this! Cant wait to try! I love making hats and scarves but I think that they would make a nice corner-to-corner blanket. Omg those pillows are awesome! I could make beautiful baby blankets with this yarn! I would love to make myself a new big purse with this yarn! I would love to win this to make a beautiful crocheted dress for my 1.5 year old who loves to play dress up! I would love all this yummy yarn. I would make a chevron blanket. I love these pillow patterns!! I would love to win this yarn. I would like to make another c2c blanket, the virus shawl, and afghan for my sons. I would love to make some crochet dolls for my children for Christmas. I would love to win this. I would make a scarf and mittens. A baby blanket for my new little one! Really digging those pillow patterns! I know some couches they would be perfect for! I’m your classic broke college student, so winning this would definitely help me out with my holiday gift-giving. Hats all around! I can’t wait to make this! I always need more pillows on my couch! Those skeins will make perfect ponchos for my girls! What a fabulous giveaway. Have only been crocheting for about 4 weeks, already completed 1 baby blanket for a local charity & have almost finished another. I would use this wool to complete several more for the charity that I’m making Baby Blankets for, they are then given to new mum’s in need along with loads of baby essentials to help them start life with a new baby. I would make some baby afghans and some pillow covers. I am learning how to crochet, so, if I could master those, then maybe I would also make a sweater with some of the yarn. 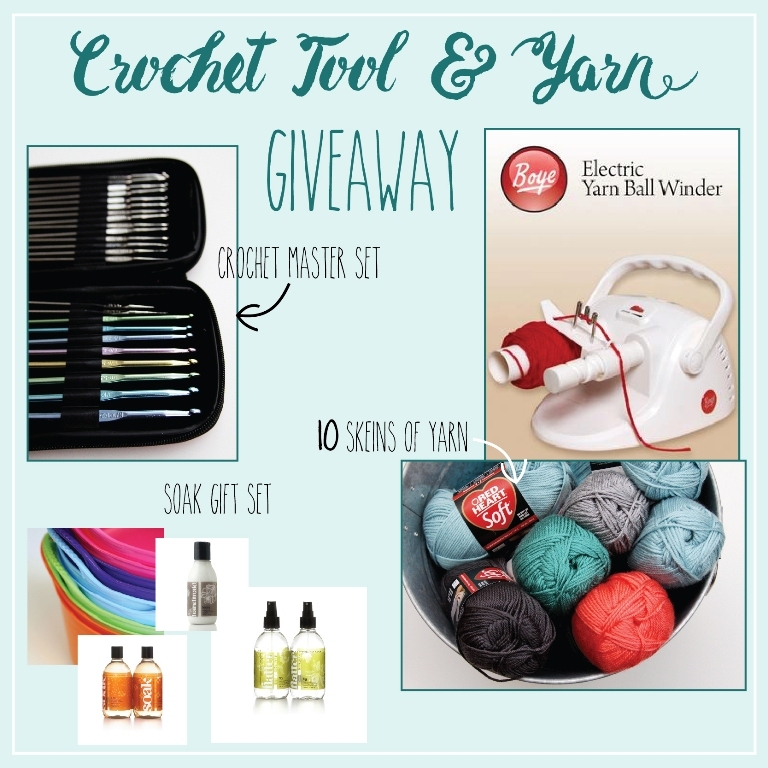 What a great opportunity to win a beginning crochet set! Thanks! I think I would make a nice soft blanket with the great yarn in this giveaway – if I was lucky enough to win! Don’t know for sure what to make with it if I win. Will have to look at it and think about it a while first. make lots of gifts for my friends and family, and have lots of crochet therapy at the same time, heehee. Oh my! fingers crossed. I’ve been wanting a yarn winder since I have memory. With the yarn I’ll make pillows for sure, winter and Christmas themed. I would make all of these pillows if I won a pile of yarn, love! Love the color used in your design, that’s what I would make! Great prizes!! I would make either a pillow or small lapghan!